The department is trying to reach the community for educating them about common urological problems. We have created a forum called the 'Prostate Forum' which tries to provide medical drugs for prostate diseases at a reduced price. We organize camps in which certain investigations are offered free of cost to the patients. The department organized 'Prostate Awareness Meeting' that was attended by more than 100 patients suffering from prostatic enlargement. The department has published many 'Patient Information Booklets' about common urological diseases that are distributed free of cost to the patients. Center of Excellence for "No Scalpel Vasectomy"
The Department is recognized as a center of excellence for 'NSV' and is a training center for the technique of NSV. Dr. N. S. Dasila organizes all the activities as State Trainer working full time for COE. The department recently bagged some grant from 'SIPSA' to upgrade the activities. This center is actively engaged in organizing camps of NSV all over the state of UP and Uttaranchal. We are also doing 'Community Sensitization Meetings' to remove the fears of the general public about sterilization. At COE we train medical colleagues in NSV and also undertake research released to the same field. 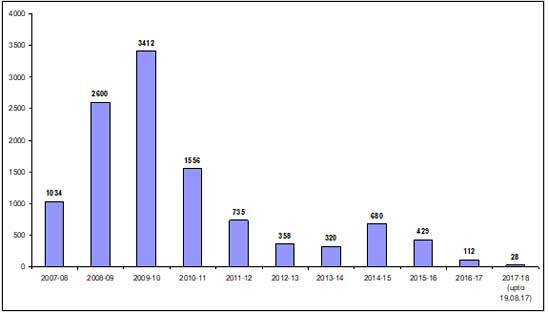 The following graphs depict the work of COE in last 11 years.